Some of us wake up every morning to find ourselves living in a society where economic opportunity is unfairly distributed, where a narrow social elite is given everything while many others endure harsh deprivation. If we live in such a society, every morning our soul yearns for a system better than that we’re in. We might live in a society where discrimination is rife, where government cronies are handed plum benefits, where extractive elites plunder national wealth. We say we want out of that system. We ask only for a level playing field, for a system that is fair, open, and transparent, a system that practices meritocracy. If what I’ve just described resonates with you, the good news is the world has your back. The world wants for you what you want for yourself, and indeed more and more of the world has been on that delivery run for a quarter of a century now. Twenty five years ago the Soviet Union collapsed, bringing on what some observers announced as The End of History. The wisdom that emerged was that only liberal democracy and free-market economics remained viable as ways successfully to organize society. What could be fairer, more open, and more transparent than a political system that declared all people equal in the process of selecting a leader – one person, one vote? What could be more meritocratic than a system where whether you succeed or fail is decided by a free market blind to social status, not some prejudiced official checking out your family connections? Liberal democracy and free-market economics are both structures that appeal to technologists and designers. In theory they have an apparent emergent intelligence that will seem magical to some: You install rules in the system; you turn on the system; you stand back, and you watch it execute to the best outcome possible for the system. If a disturbance perturbs the system, the rules in place allow innovation, flexibility, and adaption, and the system self-stabilizes to a new best outcome. The US, the UK, and other economies on both sides of the Atlantic to varying degree practice these principles. Indeed, many observers consider that TransAtlantic Axis to be where such principles are held safe, to be passed on to others. Thus, even though membership in the club of successful economies would be open to all, it was there, the TransAtlantic Axis, from which success would unfurl. And, indeed, that happened big-time: while, by one reckoning, world democracies numbered only 45 in 1970, their number ballooned to 115 by 2010. But then history decided it wasn’t quite finished with humanity. First, the 2008 Global Financial Crisis struck: from exactly the TransAtlantic Axis, waves of financial collapse lashed outwards until 12 months afterwards, in the wreckage, world financial markets had fallen by US$26tn (half of annual world GDP), an estimated additional 34mn had been thrown into unemployment, and it looked like the world financial system was on the brink still of collapse. Free-market economic orthodoxy transformed into a witch-hunt for those who dared still to suggest that market competition might produce anything other than banks too big to fail (and therefore just too big) or grotesquely unfair distributions of well-being across citizens. All the good things that free-market economics brings with it – the rich variety of consumer goods, competition that lowers prices, innovation that improves the lives of people – seem to have been forgotten or are in danger of being unjustly dismissed. 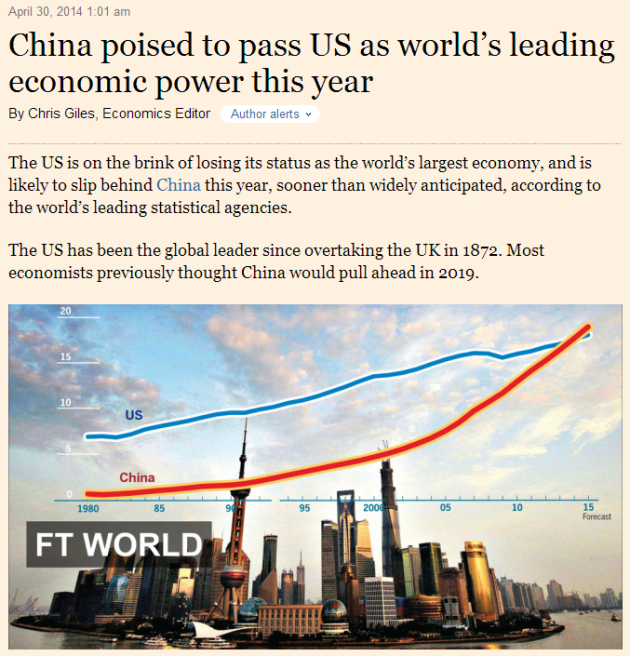 China, the world’s largest one-party autocracy, far outside the orbit of the TransAtlantic Axis, will imminently become the world’s largest economy almost surely, overtaking the US which had held that position for over 140 years. Not only that but over the last three decades China had lifted over 600mn people out of extreme poverty, while inequality in the West had gotten so bad, the income share of the population’s top 1% has recently reached heights not seen for almost a century. Over the course of the Global Financial Crisis many observers had remarked how in their view China grew only because the West imported and therefore when the West underwent austerity the effect on China would be devastating. Yet between 2007 and 2012 it was China that added most to the resuscitation of the global economy, more than 3 times the contribution of the US. 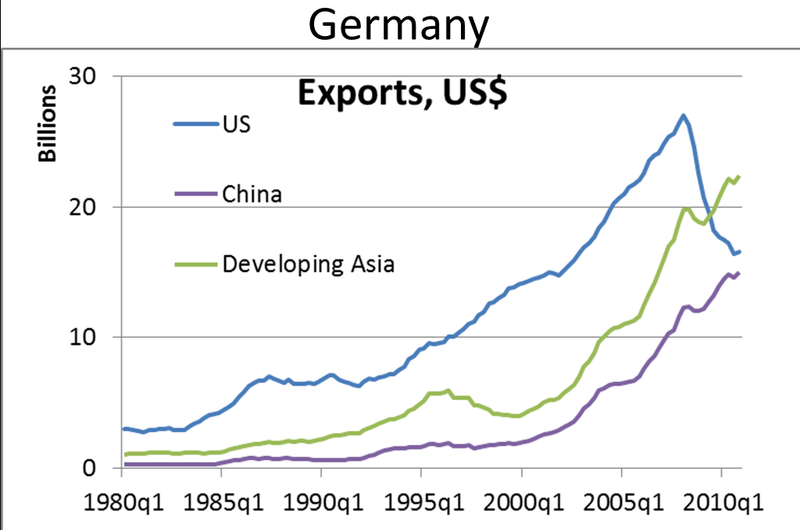 Germany, Europe’s most successful economy in this time, continued to grow — even with the collapse of its exports to its European neighbours and to the US, historically its largest export market outside of Europe — precisely by selling to China and the rest of Developing Asia. In the last 30 years the rise of the East, not just China, has pulled the world’s economic centre of gravity 5000km out of its 1980s TransAtlantic moorings, into the Persian Gulf. 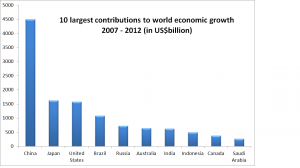 If growth trajectories continue in the 700 points on Earth used for this calculation then the world’s economic centre will soon come to rest on the boundary between India and China, 10 timezones east of the world’s traditional pole of economic power. From the perspective of year 2010, current projections of Asian supremacy extrapolated from recent trends may well look almost as silly as 1960s-vintage forecasts of Soviet industrial supremacy did from the perspective of the Brezhnev years. Yes, by 2010 those economic trends were indeed found to have given inaccurate extrapolation, not from their having been too optimistic, but instead the opposite. They have been too modest. Abbott’s conservatism also inclines him to be uneasy about modern China. Like many people in the West—and not just conservatives—he finds it uncomfortable that China could grow so quickly and become so powerful despite its authoritarian one-party political system. That challenges his deeply held ideas about the ascendency of democratic principles, which had seemed so decisively validated by the collapse of communism elsewhere in the world. Wasn’t national success only guaranteed by a mix of liberal democracy and free-market economics? Have both planks of the end of history just fallen away? How have Chinese and other Asian systems been able to innovate and to adapt when others, those arguably the more likely to succeed, instead failed to be as robust? Make no more mistake, China’s system has been truly flexible and adaptive. As Eric Li reminds us, China is a country that has taken on a dramatic range of innovation: radical land collectivization, the Great Leap Forward; the Cultural Revolution; privatization of farmlands; Deng Xiaoping’s market reforms, modernisation, and urbanisation; Jiang Zemin’s opening up Chinese Communist Party membership to private businesspeople. High-level official and party leadership posts previously for life have been replaced by those with term limits and mandatory retirement by 70, a sensibility that not even university professors keep, despite the academic profession’s insistence on ideas always having to be fresh and innovative. Obviously, any serious study on such large issues I’ve described will demand great rigour and considerable detail. Moreover, history from here on out might decide to lurch once again in an unexpected direction. Either way, however, I would shy away from concluding that one system or another is necessarily better than the other. My own hunch is there are multiple pathways to prosperity and success: the evidence, it seems to me, indicates that. Trying to say once and for all that one system is best (or even the least bad) is almost surely foolish. And while it sounds authoritative to pronounce one system or another “not sustainable”, it should be apparent to everyone that, simply as a matter of logic, such a statement can never be proven wrong. No system in history has yet been shown to be indefinitely sustainable. Where this discussion gets somewhere more concrete is instead the following. Too often, “liberal democracy” and “free markets” become simply code and catch-phrase to stand for all the bright shiny things someone wishes to have but does not. Democracy has, ultimately, meaning far more noble and important than simply, say, access to the ballot box. Instead, what it should stand for is this: Every government, every ruler must be daily insecure. Every government, every ruler must every day understand their power to be built on the shifting sands of the will of their people. And they must daily strive to advance the well-being of those people. By this measure the state in China and other officially autocratic economies throughout Asia are already more democratic than many observers might think. By this same measure many ballot-box electoral democracies fail. Every time we read yet another account of how China’s leaders desperately need the economy to grow at more than 7% a year, so enough jobs can be generated for their hundreds of millions of new workers, that’s not a creaking oligarchy desperately hanging on to power. Well, of course, it might be. But it might also be simply what’s called advancing the well-being of one’s people. This does not change how Europe will continue to be the liberal anchor of the world, even as the economic centre shifts East. But it does say alternative internally self-consistent forms of liberalism might emerge in response to different circumstances. In contrast, however, parts of our current global system carry hypocritical and damaging inconsistencies. While the TransAtlantic Axis seeks to disseminate democratic ideals throughout the world, today’s system of global governance built on US benevolent hegemony is itself deeply undemocratic. For the last 50 years our world has chosen as its leader from only among the richest and most powerful of nation states. That leader has not only status and wealth beyond those of all others, it wields unrivalled political influence and military superiority beyond imagination. As leader, it operates with effectively no counterbalance on the international stage. In brief our current world order is built on the leadership by military and economic power; that world order pays no mind to how well that the global leader serves humanity. US hegemony in the current world order is a system of leadership that is truly and deeply undemocratic. 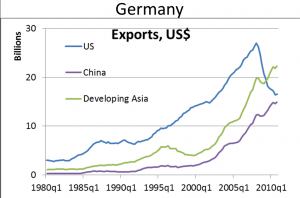 This is why a simple graph of China’s economic overtaking the US or the world’s economic centre of gravity hurtling to ten timezones east of Washington DC might seem so disconcerting to the TransAtlantic political elite. If US hegemony in the current world order will soon have neither economic nor political legitimacy, does that hegemony simply become despotism? Why should it remain? 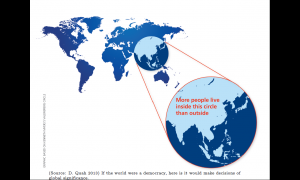 If the world were a democracy this is where it would make decisions of global significance. From an idea due to Ken Myers. From a point in the South China Sea, roughly in the same timezone as the world’s economic centre of gravity, draw a circle 4000km in radius. This is a tiny circle, comprising only 25mn sq km of land, only one-sixth of the planet’s land area. Yet, this circle contains more than half of humanity. If we want to construct a new world order with democratic legitimacy and economic strength, let’s begin here, with fresh ideas, and see where that takes us. Author: Danny Quah is professor of economics and international development and director of the Southeast Asia Centre at the London School of Economics.